A good wife, mother, daughter, sister, "Gran" and friend. Her cancer cured. Her pain is gone. She can again be with the man that she continuously called for, her Hawthorne (She always called the love of her life by their last name). This women who loved and was loved, Jimmy's Gran, went to be with the Lord yesterday. Always holding pictures close to my heart, during times like these they are held even closer. Encouraging you to continually take pictures/have pictures taken of your family. We were so sorry to learn of Jimmy's Gran's passing. She is, indeed, in a better place. I know that she will be missed beyond belief by your family. So glad you were able to capture such beautiful photos and precious moments. You are right, pictures like this might as well be gold. As we've said many times this weekend, know our love, thoughts and of course many prayers are with you. We are very sorry to hear about Gran. Our thoughts and prayers are with you. We love you. Please let us know if there's anything we can do. Much love. I'm so sorry for your loss. What onderful pictures for wonderful memories. Love to you all. I hate to hear about your loss, but I am so glad Gran got to see sweet little Ada. The photo of them is beyond words. What sweet pictures and even sweeter words. your family will be in our prayers. 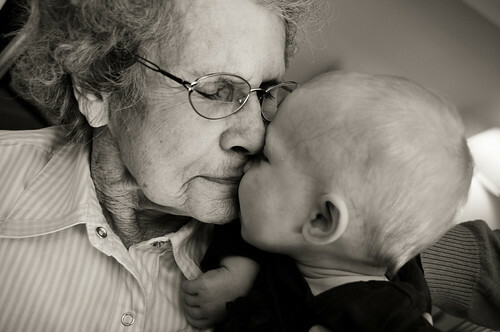 The pictures you have captured are priceless and should remind each of us to never take for granted our grandparents. Brian, Jennifer and the three Pelfrey children. What a precious picture of Ada and her gran. My girls call my mom gran, so that name holds a special place in my heart. Praying for you and your family. What wonderful sweet memories you captured with a very important person in your lives. Mine and Van's thoughts and prayers go out to you for your loss. What a beautiful tribute...I'm sorry for your loss, but celebrate that she is with our King! Love you three! !